Ichiriki wins 7th O-kage Cup: The final section (last four rounds) of the 7th O-kage (Gratitude) Cup, a tournament for players aged 30 and under, was held on the bank of the Isuzu River and at the Alley Ki-in in Ise City in Mie Prefecture on May 14 and 15. The sponsors are a group of tourist-trade shops (many of them recreations of Edo Period buildings) in Gratitude Alley, the street leading up to the Ise Shrine (later in the month, this area was the site of the G7 summit). The players who made the final, Ichiriki Ryo 7P and Anzai Nobuaki 7P, are fellow disciples of So Kofuku 9P. 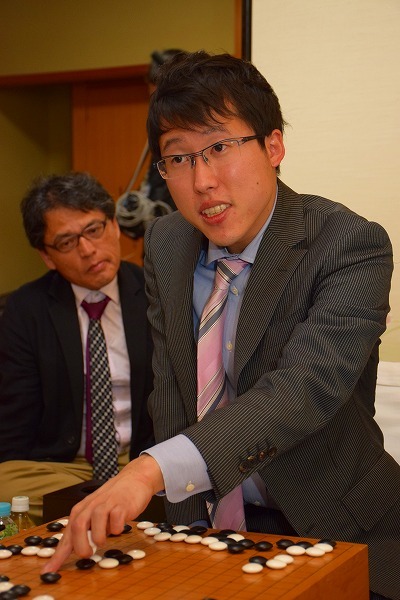 Anzai is the older, 30 to Ichiriki’s 18, and won the 2nd and 3rd terms of this tournament, but Ichiriki has recently developed into one of the top players of the post-Iyama generation. Taking black, Iyama beat Anzai by resignation after 183 moves and won this title for the thirdtime in a row. First prize is three million yen. the Honinbo League, Motoki Katsuya 7P, and women’s triple crown-holder Xie Yimin. As it happened, all these players were eliminated in the first round. 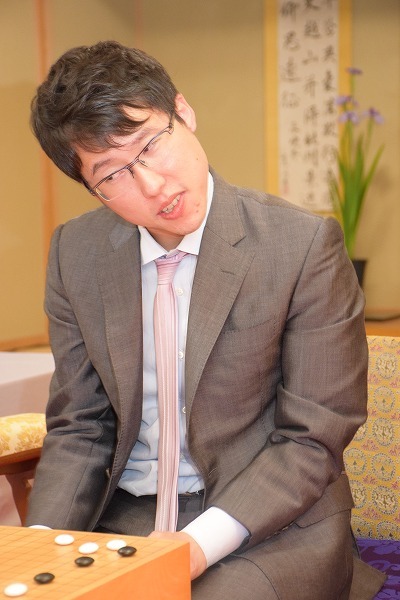 Iyama close to defending Honinbo title: The challenger Takao Shinji 9P made a good start in his challenge for the 71st Honinbo title, winning the opening game, but nothing has gone well for him since. ’s attempts to get back into the game. Early in the game there was a spectacular trade that gave Takao a large area but also gave Iyama a lot of ko threats. Iyama made good use of them to secure a large territory of his own. Still fighting continued, with Iyama making an unexpected but severe invasion. Takao was ahead in territory, but Iyama’s constant attacking paid off. An unusual feature of this game was that Iyama twice made a tortoise-shell capture; it’s rare for one to appear in a pro game, let alone two. It’s proverbially worth 60 points, twice as much as a ponnuki. Late in the middle game, Takao made a last-chance attack on a white group, but Iyama found a clever move to settle it and nursed his lead to the end. Takao resigned after 230 moves. Incidentally, the 24th was Iyama’s birthday (he’s now 27); he gave himself a good birthday present. The third game was played the Old Ryotei Kaneyu in Noshiro City in Akita Prefecture on June 2 and 3. (“Ryotei” is a term for a traditional Japanese inn; here “Old Ryotei” has been incorporated as part of the name. This inn is a palatial building made completely of wood; it has been registered with the government as a “tangible cultural property.”) In contrast to the second game, the players made a solid and steady start. Inevitably a fierce fight started in the middle game, with a ko attached. 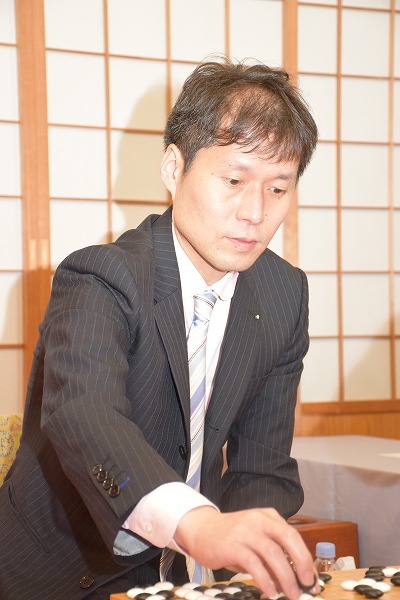 Iyama played strongly and forced Takao to resign after 207 moves. 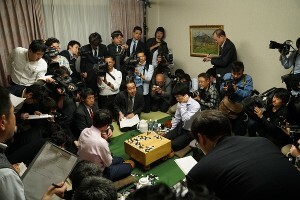 The fourth game was played in the Olive Bay Hotel in Saikai City in Nagasaki Prefecture on June 13 and 14. This was the most fierce game of the series so far, with fighting starting early in the opening. Playing white, Iyama cut a l arge group into two and killed both parts of it. Takao resigned after move 128. The game finished at 2:44 pm on the second day, Takao had two hours 33 minutes of his time left and Iyama had one hour 48 minutes left. The fifth game will be played on June 29 and 30. 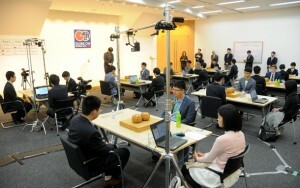 Murakawa becomes Gosei challenger: The play-off to decide the challenger for the 41st Gosei title was held on May 18. Murakawa Daisuke 8P (W, right) beat Yamashita Keigo 9P by 4.5 points, becoming the Gosei challenger for the first time. This gave Murakawa revenge for losing the play-off to decide the Kisei challenger to Yamashita three years in a row. He will be the second player to try to put a dent in Iyama’s septuple crown. The title match will start on June 25. 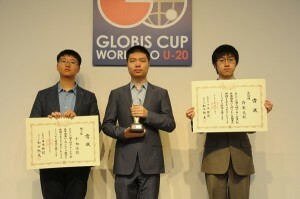 A report on this year’s Globis Cup appeared earlier this month in the E-Journal (China’s Li wins 3rd Globis Cup 5/9). Here is a commentary on the final, based on Go Weekly and the live commentary by O Meien 9P (click on link below). This year the finalists were Li Qincheng 1P of China (aged 17) and Kyo Kagen (also known as Hsu Chiayuan or Xu Jiayuan) 3P of Japan (aged 18). In the nigiri, Li drew black. Playing conditions are the NHK format (30 seconds per move plus ten minutes). As last time, O was assisted by Mannami Nao 2P. This tournament was founded to give young Japanese players more experience against top-level competition. In China and Korea, it’s not unusual for a teenager to be winning top titles. The best example of that is Ke Jie 9P of China. He is still only 18 (he turns 19 on August 2), but he has already won three international titles. 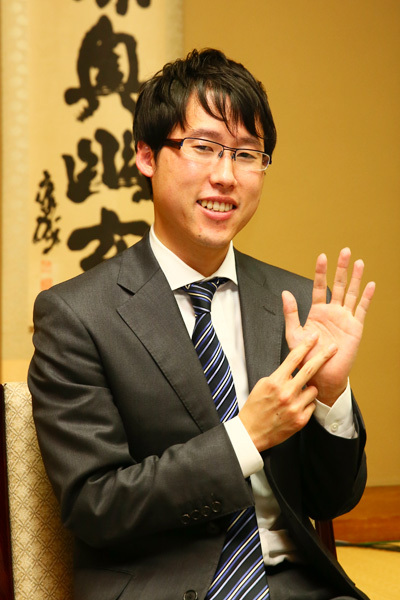 So far, no teenager in Japan has won a top domestic title; the biggest prodigy, of course, has been Iyama Yuta, who started winning titles when he was 16, but he did not win a top-seven title, the Meijin, until he had turned 20. Why the difference? In my view, the explanation is simple: the Korean and Chinese players come out of a much bigger pool, because of the much greater popularity of go among young people in these countries. The Power Report: Honinbo title match starts; Septuple crown in danger? The first game of the 71st Honinbo title match was played in the Honinbo Shusaku Igo Memorial Hall (right) on the island of Inno-shima (Shusaku’s birthplace) in the city of Onomichi in Hiroshima Prefecture on May 9 and 10. This is Iyama Yuta’s first title defence since completing the first-ever Grand Slam of the top seven titles. The challenger is Takao Shinji 9P, who has a bad record against Iyama (13-30 before this match) but who took the Tengen title from him in 2014, thus slowing down his quest for the grand slam. Takao has also been in great form this year and, as of May 3, had 13 wins to one loss. Takao (left) drew white in the first game. 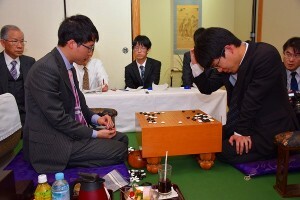 During the middle game, Iyama (right) made a strong attack on a white group; Takao sacrificed it, getting an attack on two black groups as compensation. Later, Takao was able to force Iyama into a large ko fight that could potentially decide the game. Lacking ko threats, Iyama finished off the ko and let Takao revive his dead group. This trade was favorable for Takao. Iyama did his best to catch up, but couldn’t quite manage it. Takao likes to build thickness and in this case his thickness did him in good stead in the endgame. Iyama resigned after White 244. This was Takao’s first win against Iyama after a string of seven losses. This is just one loss, so, my headline notwithstanding, Iyama will not yet be too worried. The second game will be played on May 23 and 24.
by John Power, Japan correspondent for the E-Journal. As in 2015, I was invited to cover the Globis Cup for the E- Journal; I hope readers will forgive the delay in submitting my report. China’s Li wins 3rd Globis Cup: The third Globis Cup, an international tournament for young players sponsored by the Globis Corporation, was held from April 22 to 24. Li Qincheng 1P (left) of China won. The full name of the tournament is the Globis Cup World Go U-20, and it is open to players under 20 as of January 1 of this year. Participating were six players from Japan, three from China, three from Korea, and one each from Chinese Taipei, Europe, North America, and the Asia/Oceania zone. The venue was the Graduate School of Management, Globis University, a business school run by the corporation; it is located in the Kojimachi area, a short walk from the Nihon Ki-in. The tournament is the brainchild of Hori Yoshito (right), who is the president of Globis University and also a director of the Nihon Ki-in. At present, this is the only international tournament held every year in Japan and the only one for players under 20. The aim of the tournament is to raise the level of teenaged players in Japan who may not have many opportunities to take part in international tournaments. Of course, all the participants benefit, but the founder Mr. Hori is particularly concerned to raise the level of Japanese go and has set the 100th anniversary of the founding of the Nihon Ki-in (2024) as the target date for achieving this ambition. the EJ, Huang Yunsong 4P of China beat Na Hyeon 6P of Korea in the final. Below is a full list of this year’s competitors with their ages. 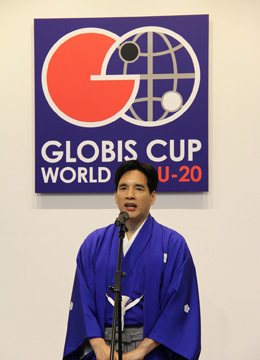 Like some other international tournaments, the Samsung Cup, for example, the Globis Cup is made up of two stages. In the first, the players are split up in to four groups, in which the players play each other in a double knock-out. You qualify for the main tournament when you win two games (one player will do so with a score of 2-0, the other with 2-1). The second stage is then a regular knock-out tournament. Unfortunately, none of the amateur players scored a win. Below are the results in the second stage. Tournament conditions are the same as for the NHK Cup, that is, 30 seconds per move plus ten minutes’ thinking time to be used in one-minute units. Quarterfinals: Li (China) (W) beat Shibano (Japan) by resig., Byeon (Korea) (W) beat Lin (Ch. Taipei) by resig., Yang (China) (B) beat Shin (Korea) by 7.5 points, Kyo (Japan) (W) beat Lee by resig. Semifinals: Li (B) beat Byeon by resig., Kyo (B) beat Yang by resig. Final: Li (B, center) beat Kyo (right) by resig. Play-off for 3rd place: Byeon (B, left) beat Yang by resig. 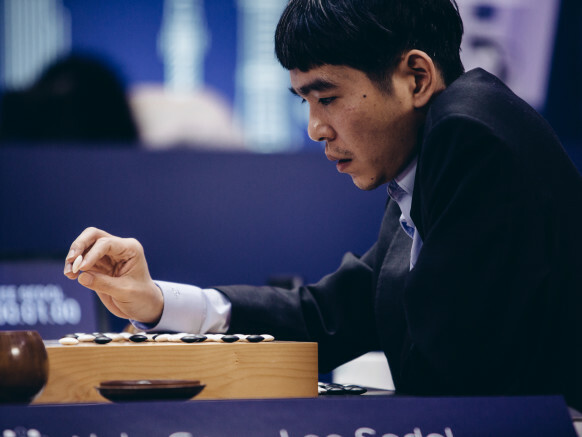 In the final, Kyo started fairly well playing white, but he missed the decisive points in large-scale middle-game fighting, so Li took a safe lead. As far as I know, this is Li’s first tournament victory. Kyo had to be satisfied with second place for the second time; he will get one more chance to play in this tournament. Incidentally, both Li and Kyo scored 2-1 in the first stage. Takao leads Meijin League: Takao Shinji 9P, the previous challenger, has the provisional lead in the 41st Meijin League with four straight wins, but two other players, Cho U 9P and Murakawa Daisuke 8P, are also undefeated on 3-0 (they have each had a bye). Round 4 of the league has been completed. The league is proving inhospitable for the two league debutants, who have yet to win a game. Hirata Tomoya and Uchida Shuhei are both 0-4. Recent results: (March 3) Hane Naoki 9P (W) beat Kono Rin 9P by resig. ; (March 10) Murakawa Daisuke 8P (B) beat Ko Iso 8P by resig. ; (March 17) Takao (B) beat Hirata by resig. ; (March 24) Yamashita Keigo 9P (B) beat Uchida Shuhei 7P by resig. Fujisawa Rina wins junior tournament: The final of the 2nd Ibero-Japan Cup, a tournament limited to players under 18, was held at the Nihon Ki-in on March 18. Fujisawa Rina 3P (W) beat Shibano Toramaru 2P by resig. This is the second win by a woman player in a tournament open to both sexes (the first was Xie Yimin’s win in the 1st Young Carp tournament ten years ago). This is a good win, as Shibano is building a reputation as one of the top players of his age group, along with Kyo Kagen 3P, whom Fujisawa beat in the first round. 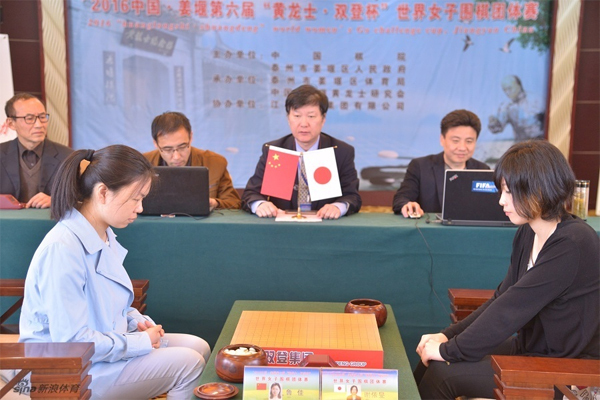 Tuo wins 2nd Japan-China Ryusei: This is a play-off between the winners of the Japanese and Chinese Ryusei titles and was held at the Chinese Qiyuan (Ki-in) in Beijing on March 16. Taking black, Tuo Jiaxi 9P of China beat Yuki Satoshi 9P of Japan by resig. Three-way tie in junior international tournament: The 4th Japan-China-Korea Young Stars tournament, sponsored by the Korean Baduk Association, was held in Hapchon, Korea on March 19 & 20. This is an all-play-all tournament for three young players from these countries. It started with Onishi Ryuhei 1P of Japan beating Pak Zonghun 1P of Korea but losing to Liao Yuanhe of China. Liao then lost to Pak, so the result was a three-way tie. fter retiring in 2010.His older brother, Kiyoshi 9P, is also a professional. 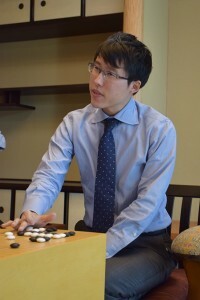 Cho Chikun wins 2015 Title Winners Tournament: This is a new tournament now in its third term. Participants are all the title winners from the previous year plus one player selected by a vote by go fans. Even though Iyama holds six titles, there were still eleven participants in this year’s tournament. Tournament conditions are the same as the NHK Cup (30 second per move plus ten minutes). The semifinals and final were held at the Nihon Ki-in in Ichigaya, Tokyo on March 19. In the semifinals, 25th Honinbo Cho Chikun beat Yo Seiki 7P and Kyo Kagen 3P beat Iyama Yuta, winner of the first two tournaments. The final was played on the stage in the second-floor hall of the Nihon Ki-in with a public commentary being given on the same stage. Cho (B) beat Kyo by resignation after 217 moves. since the 68th term, when he lost 3-4 to Iyama Yuta. Takao won the 60th to 62nd Honinbo titles and was Meijin Honinbo in 2004. The title match with Iyama Yuta will start on May 9. Recent results: (March 17) Cho U 9P (B) beat Yo Seiki 7P by resig. ; Ichiriki Ryo 7P (W) beat Kono Rin 9P by half a point. (March 31) Takao (W) beat Kono by resig. ; Yamashita Keigo 9P (B) beat Yo Seiki by half a point; Motoki Katsuya 7P (W) beat Ichiriki Ryo 7P by resig. ; Cho U 9P (W) beat Ida Atsushi Judan by resig. Iyama switched to invading the top right corner. When he settled his group in sente, he got a good game. Ida later invaded White’s bottom left position; he lived, but White severely harassed his group, taking a definite lead. Ida resigned after 206 moves. 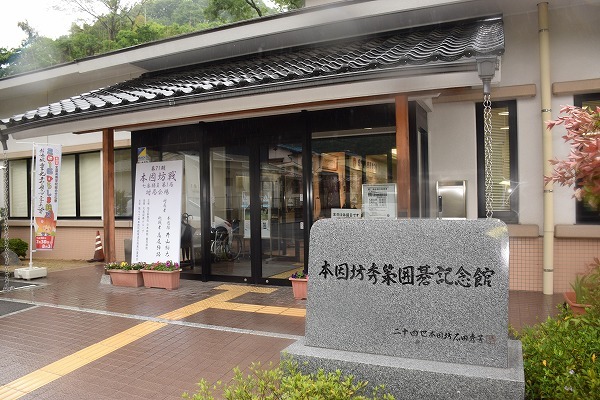 The second game was played at the Yu-no-yama Hot Spring Yumoto Green Hotel in the town of Komono in Mie Prefecture on March 23. The first 41 moves were the same as in Game Three of the Korean Myeongin (Meijin) title match, played on January 20 between Park Junghwan (black) and Lee Sedol. 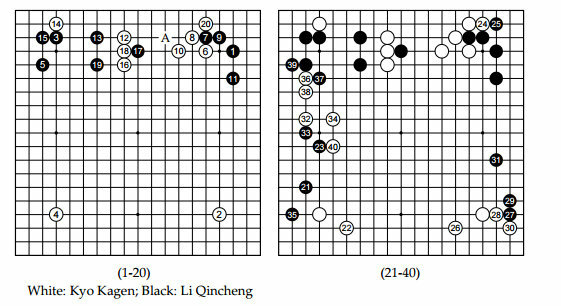 Iyama had reviewed the game in a study group and concluded that the opening, in which Black built thickness, was not bad for Black and wanted to try it out in a game. Ida obviously felt that it was playable for White, though he diverged from the Korean game with move 42. In the middle game, the game seemed even, but Ida made two mistakes: playing in the wrong direction with 124, then choosing the wrong hane out of two possibilities with 134. The latter move was labeled the losing move. Ida faces a kadoban, that is, a game that could lose a series, on April 14. Iyama has now won 18 title-match games in a row. 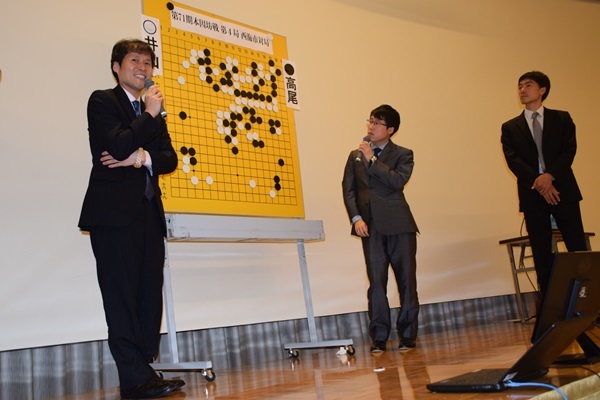 Xie defends Women’s Meijin: The second game of the 28th Women’s Honinbo title match was held at the Osaka University of Commerce on March 9. As has been the recent practice, it was held in conjunction with the Judan title match. Playing black, Aoki Kikuyo 8P forced a resignation after 209 moves, so she evened the score. The third game was held at the Nihon Ki-in in Ichigaya, Tokyo on March 16. In a tense endgame contest, Xie emerged the victor by half a point, so she defended her title. She has now held it for nine years in a row and it is her 23rd title overall. Xie was also recently named as a Guest Professor at the Heian Jogakuin University (Jogakuin means Women’s Academy), which was the venue of the first game. The university is also known as St. Agnes’ University and is Anglican. A game in the title match has been held at this university for five years in a row. Xie has played in all of them, and on each occasion has given students instruction in go the day after the game. Correction: The first game was played on March 3, not February 28, as given in my previous report. Cho U wins NHK Cup: The final of the 63rd NHK Cup was telecast on March 20. The finalists were Cho U 9P, who has won this title three times, and Teranishi Rei 4P, who reached the final on his debut in this tournament. Playing with white, Teranishi perhaps took a small lead after a large-scale trade arising from a ko fight, but Cho overhauled him in the middle game. Teranishi resigned after move 211. Cho’s last NHK cup was eight years ago; this is his first title since 2012. Last year Cho moved back to Taiwan with his family, partly to give his children a chance to learn Chinese and partly to try and recover form. He “commutes” to Japan for his tournament games. His NHK win may be a sign that this decision is paying off. Apparently he plans to return to live in Japan this summer.